Microsoft, BermanBraun and Hachette Filipacchi Media U.S. have launched Glo, a new lifestyle site that focuses on fashion, beauty, lifestyle and relationships content that combines the imagery and feel of a magazine, with the appeal of a dynamic site such as WONDERWALL. • Scrapbook. This feature allows readers to save a custom page of their favorite images and ideas from the site, just as if they were tearing them out of a magazine. • Sharing tools. Sharing tools are included on each page and allow readers to share articles, videos and more with friends and family via e-mail, Twitter, Facebook and Windows Live. • Bing integration. Bing, the new generation of search from Microsoft, is deeply integrated throughout Glo. Bing is a decision engine that offers a faster way to make more informed choices. • Facebook. This feature allows customers to comment on articles and videos they see on Glo using their Facebook login information. • Full-screen photo galleries. Glo is loaded with visually compelling, full-screen photo galleries, covering a range of topics that are better seen than read, such as the best shade of red lipstick and chic body art. 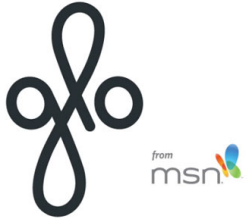 Glo utilizes a unique vertical scrolling method, a feature that is exclusive to the site as an online lifestyle destination, according to Microsoft.